Meeting customer needs by providing online help. Using LiveChat on their website to offer online help. Smooth communication, 96% customer satisfaction. When a university’s library adds a communication channel on their website such as LiveChat, they get tons of happy visitors as a result. Where does that magic happen? In the Paul Martin Law Library, at the University of Windsor. Let me bring you closer to their story. The University of Windsor is a comprehensive, student–focused university, with more than 15,000 students enrolled in a broad range of undergraduate and graduate programs. The University is located in Ontario, Canada. 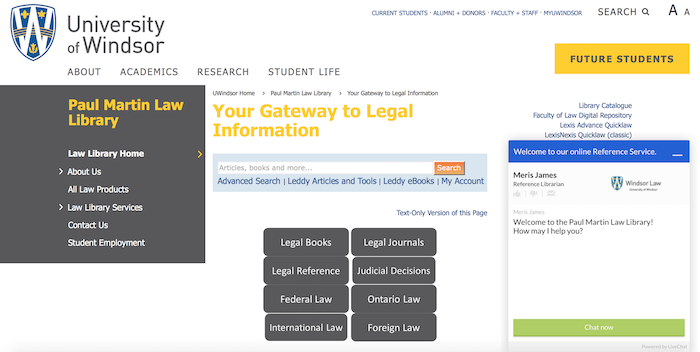 The Law Library allows users to discover and find articles from scholarly journals and newspapers, books and book reviews, videos and other types of media. The resources are gathered in their library catalogue. But using the catalogue to go through the whole process, visitors can sometimes feel a little bit confused. That’s why the Paul Martin Law Library provides LiveChat on its website, to always be there for their visitors. They dispel any doubts and let students find and use their resources in the most efficient way. We use LiveChat in our library to ensure that customers who visit our website are provided with assistance even when they’re not with us in person. University of Windsor’s Library has over 6000 hits on their website per month. The website visitors may need reference service, so Windsor’s employees wanted to have the possibility to reach out to visitors anyway. It also has the simplest user interface and the best price point. The Paul Martin Law Library employees like providing help through LiveChat. They have four full-time employees and 4 part-timers that work in shifts and monitor incoming chats. One of their favourite features is message sneak peek that helps them to answer questions promptly. Message sneak peek is a feature that allows you to see everything that customers are typing in the chat window before they send it over. It helps you to prepare for answers and discover issues that normally would go unnoticed (for example if a customer don’t send their message after all). They also use chat tags and chat archives and it gives them access to a whole new level of customer data. This way, the Law Library employees are able to look up statistics for a particular type of cases only, like “basic” or “password help.” Then, they can check the level of satisfaction. If customers are not happy with it, they know they could change something to improve their experience. They also like customizing LiveChat, claiming that it’s a lot of fun, especially when they can try different eye-catchers suitable for their website and the season of the year, like Christmas or Halloween. It is fun to have customizable chat window themes and the eye catchers are terrific. We actually try to change the eye catchers regularly to improve visibility. What’s also important for them are pre- and post-chat surveys. With pre-chat surveys, they can gather visitors’ information like name, email and also the subject of the message and the actual issue. Who is the visitor? For example, University Windsor Law Student, Lawyer, member of the Public. The post-chat survey allows them to gather feedback after each chat, by asking a specific question or letting visitors rate the service they received and leave a comment about it. It helps to improve the service for the future. University of Windsor’s employees are very happy with LiveChat. They are satisfied with the possibility of providing efficient help for all the people who aren’t even in the library. They plan to keep discovering all the available features in LiveChat to make their work even more smooth. Most important, they have 96% of customer satisfaction so far and they plan to keep it. With visitors so happy with having live chat option on the website, it can’t be any other way. The University of Windsor is a comprehensive, student-centred university, uniquely located on the Canadian-U.S. border. It’s a comprehensive, student-focused university, with more than 15,000 students. Rising the online customer service standards in the loans industry. New levels of customer satisfaction as a result of LiveChat. 5 minute setup, test out the Team plan features for 30 days, no credit card required.